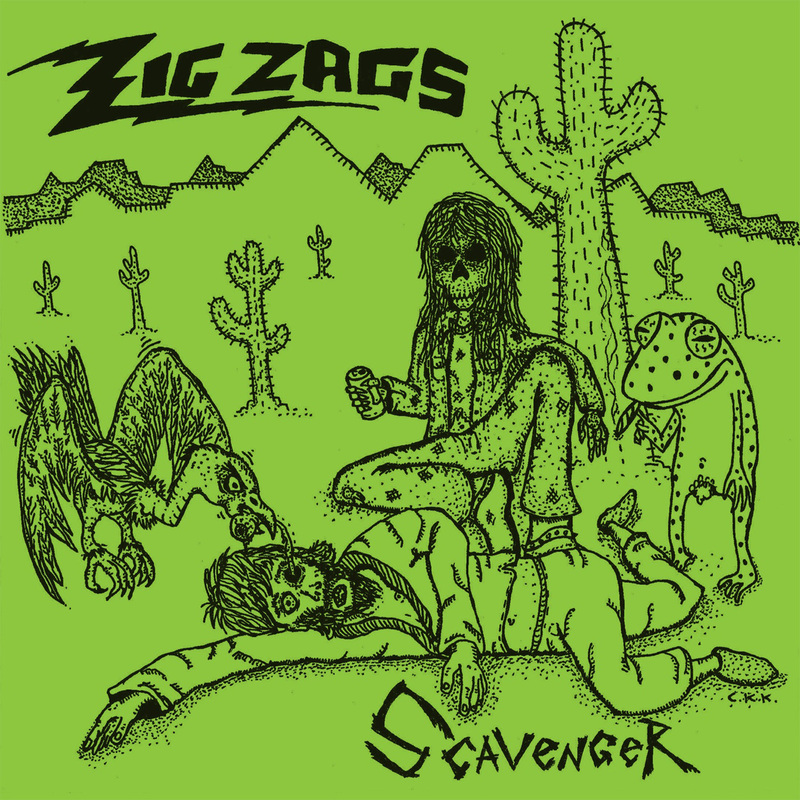 Zig Zags - "Scavenger" b/w "Wastin My Time"
Zig Zags. Los Angeles. Named after the shoes. That’s what we were wearing at the time… “Scavenger”- unloads like Budgie’s “Breadfan” played in a high school heavy metal bedroom while the band screams threats to all freeloaders and marauders who show up to parties empty handed. “Wastin’ My Time”-a more straightforward punker, keeps up the tempo but locks into a repetitive krautrock groove that worms its way into your ear holes like those brain eating maggots in Beastmaster. Cover dude (drawn by Chad Kawamura of the Outdoorsmen) getting eating by a vulture is one of the aforementioned freeloaders we have to deal with out here while our dead friend Randy watches the carnage drunk on Olympia beer like a zombie Clint Eastwood. Zig Zags have shared personnel with West Coast nose-garage royalty the Intelligence and Unnatural Helpers, and make their Mexican Summer debut with this fine piece of plastic. Zig Zags "Scavenger" b/w "Wastin My Time"